Beleaguered by a series of apocalyptic visions, Curtis (Michael Shannon), questions whether he needs to shelter his wife, Samantha (Jessica Chastain) and daughter, Hanna (Tova Stewart) from a coming storm, or from himself. Blossoming writer/director Jeff Nichols plunges the viewer head-first into Curtis’ nightmarish mind, where reality and fiction become intertwined. As the film builds in a heady crescendo, it becomes increasingly doubtful as to whether his visions represent the foreboding of an annihilating disaster, or the signs of an inevitable mental illness. By doing so, Nichols’ approach achieves something of an oddity: an end-of-the-world film that, instead of hinging on monstrous set pieces, focuses on the fear of the unknown, and the very real chance that this could happen to any one of us. Along the way, Nichols uses his skill behind the camera, and David Wingo’s percolating score, to inject some unexpected thrills and petrifying visuals (a destructive tornado and an attacking flock of birds are two that leap to mind) to accentuate Curtis’ inner turmoil and the impending doom him and his family could be facing. These moments are cleverly undercut by tender, human snapshots of his seemingly cosy family life, put under pressure by his increasing paranoia, burgeoning financial difficulties and Hanna’s ever-deepening health problems. Throughout, Curtis is shown as a man who – despite whatever trials he is faced with – would do everything in his power to protect the welfare of his family. This grounding enables the film to cary more emotional resonance than most. Shannon is persistently convincing as Curtis, delivering an unnerving, realistic and multi-faceted performance, which captures each side of his personality with near pitch-perfect accuracy. Chastain, Stewart and Shea Whigham (as Curtis’ co-worker Dewert), provide substantial support, with Chastain furthering her position as the independent film worlds current darling. 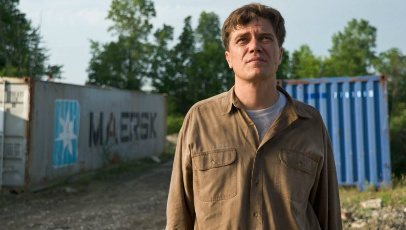 Take Shelter is an exacting, competent and unsettlingly perceptible portrait of psychosis, assuredly executed by rising filmmaker Jeff Nichols and his invaluable cast.